Trip 21 to Uganda, Post 2 – On our way. Five of us left Charlotte, NC on Thursday and we will arrive at the orphanage Saturday. Projects include: Adding 50% more solar panels and capacity to the power grid at the orphanage, install an electric pump/chlorinator/storage tank on a water supply at a school, build 100 desks for a 2nd school, build a greenhouse at the home, add more security lights, and build a merry go round at the home. We will welcome 19 new kids, aged 5 to 13, into the orphanage. This is my favorite part. They may never been hugged, told about Jesus, or felt safe and valued before. This will make the total cared for at the Child Redeemed Home, 60. 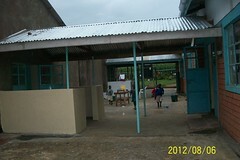 Hold meetings and pray about assisting a primary school near the home. It was founded 2 years ago and has about 220 kids. Holding a soccer tournament outreach for the children in the community. And in general share our time and God’s love with the kids and community. We appreciate prayers for our families, our health, protection, and direction. There is a lot going on and I want to stay behind God, not in front. Updates to come. ← Merry Christmas, Peace and Love!